Data: I am trying to identify the snails that made these egg cases in my backyard in Seattle Washington. I found the cases in the ground in a shady place in early September. At first they are closed, but in a few days they open on top as you see in the photo. I looked at the little "eggs" under a microscope (I am a biology teacher), and they seem to be baby snails. I've never seen snails in my yard before, only slugs. I know of no snails or slugs with egg cases such as these. Eggs of snails and slugs are spherical to oblong and are laid singly or (in most garden species) in clusters of a few to many eggs. I'm unable to say what the cases are, but the 'baby' snails may in fact not be juveniles. It's difficult to see from your photo, but the colour and shape suggest a species of Vallonia (perhaps either V. excentrica or V. pulchella), common in gardens and waste places. Vallonia spp. are rather flatly coiled, white snails < 2.8 mm across. That's what I suggest. 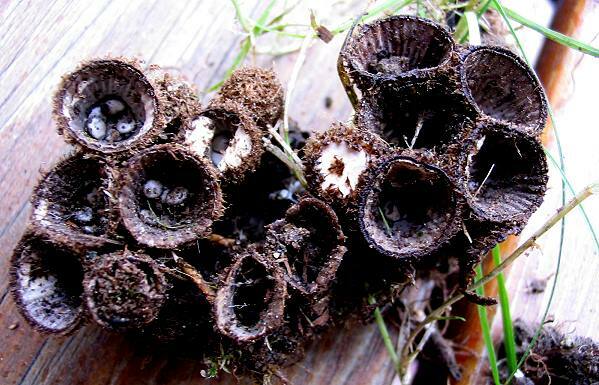 I'd be interested in learning what others conclude...Regards, Robert F.
These are not snail eggs but a fungus, Cyathus olla, commonly known as "bird's nest fungus". More information here for anyone who is interested: http://waynesword.palomar.edu/pljune96.htm ....Paul M.
I agree with Paul and Allen that they are a type of micro-fungi. Even here in Israel we have similar types of fungi growing on dead branches laying on the ground during the rainy period... Henk K. M.
My 2 cents' worth: they "explode" when hit by rain and the spores attach to house siding and are nearly impossible to remove. They grow on wood mulch. Get them far away from the house! ...John W.